Killer Characters: While the cats are away ... our guest is Victoria Thompson! While the cats are away ... our guest is Victoria Thompson! 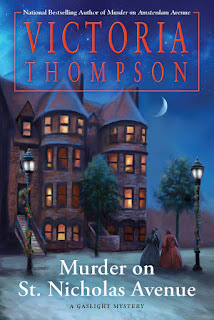 Welcome our guest, Victoria Thompson, author of the Gaslight Mystery series, set in turn-of-the-last-century New York, and the "bonus novel" MURDER ON ST. NICHOLAS AVENUE (out Nov 3, 2015). Leave a comment below by midnight, Sunday, November 1, for a chance to win a copy of MURDER ON ST. NICHOLAS AVENUE! Well, I don’t want to give anything away. You’ll have to read Murder on St. Nicholas Avenue to find out. Victoria Thompson writes the Agatha and Edgar® Nominated Gaslight Mystery Series, set in turn-of-the-century New York City, featuring midwife Sarah Brandt. The18th book in the series is Murder on St. Nicholas Avenue. She also contributed to the award-winning MANY GENRES/ONE CRAFT. Victoria teaches in the Seton Hill University MFA program in writing popular fiction. She lives in the Chicago area with her husband and a very spoiled little dog. 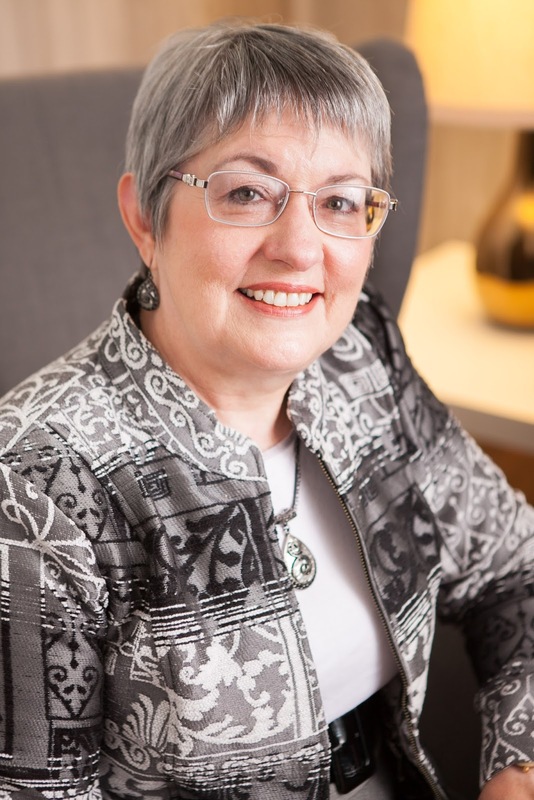 She is a member of Sisters in Crime and Novelists, Inc. So you, too, have a spoiled dog. The only difference here is that ours is a "spoiled BIG dog." I love winning new fans! This one is on my books-to-buy list. I love this series and look forward to reading even more by Victoria. This particular story sounds like it might be more than a tad humorous and perhaps even a comedy of errors. I think you'll get a few smiles. Love this series. And my grandmother lived on St. Nicholas Ave at the turn of the century when it was very posh. I've read Murder on Fifth Avenue and Murder in Chelsea and loved them both. I'm excited for this book because Maeve is an entertaining character. Fun to hear Maeve's voice. She's certainly been developing as a character. I think I would enjoy reading your book and reporting on it at the Mystery Book Club To which I belong. Sounds like a series I want to try. Thanks for introducing me to this author. This series of books is totally incredible to read --- she does such a good job of re-creating the Victorian period --- haven't found one so far I haven't enjoyed! Can't wait to get this one!!! Great series, kind of a sleeper, you don't realize how good it is until you start reading. Thanks for the giveaway. Sounds like a great cozy mystery. Thank you fro the giveaway. This sounds like an interesting and funny book. I would put it in my to be read pile. These characters are like family . Can't wait to enjoy this next peak into their lives. I've recently discovered Victoria Thompson earlier this year and have read many of her books and have been hooked since. I look forward to reading MURDER ON ST. NICHOLAS AVENUE. I look forward to the new Christmas mysteries. I'd love to win. I've read all your mysteries and am a big fan. I'm looking forward to reading this one and the next Sarah Brandt book. Also love Mrs. Decker and Mrs. Malloy and happy to see them involved. Sounds like such a good book! Can't wait to read it. I love to read this type of books. Thanks for the chance! 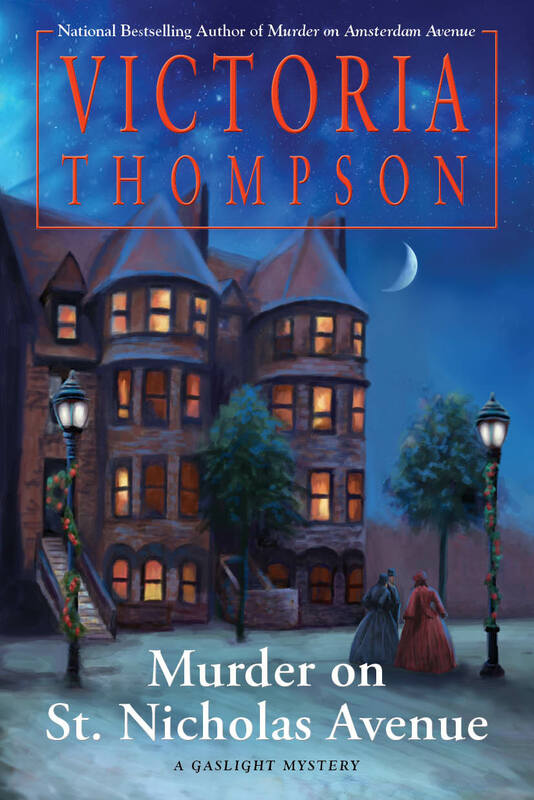 I was looking for a new mystery series to read so I was glad to find Ms. Thompson's Gaslight series! I go through books pretty quickly so I was thrilled to find that there are 17 previous books in the series for me to read. Thanks for the chance to win the latest book in the series...cheers! I'm looking forward to the next adventure and am glad that everyone else is getting involved in solving the mysteries. Having read the synopsis of this book, I'd love to read it. Sounds like it's my kind of book. I love the Gaslight Mysteries! I wonder if Maeve and Gino will get together??? I hope it doesn't take them 17 years! Sounds like a good book! Thanks for the chance to win! I have read every book in this series and cannot wait to get a bonus book this year!! I LOVE this series! I will miss Sarah & Frank being in the story as main characters but it will be fun to get to know Maeve & Gino better. I can;'t wait for the new book to come out! I, too, live with two spoiled little dogs, and a very spoiled Siamese cat. I do love this series! I cannot wait for this book. Love this series. Thank you for the opportunity. Love the Gaslight Mysteries!! Looking forward to the next one. I've enjoyed all the Gaslight series books, looking forward this one. Seems like we are going to miss the honeymoon but that's fine. I would rather be reading about the mystery. I loved the snippet of this book. It has left me really wanting to get a copy of the book to read and review. I so enjoy a good mystery. Thanks for your generous giveaway. oooo, sounds good but then I do love a good mystery! I love the series and reading about the Gilded Age! I'm so glad we didn't have to wait a year for another book. How exciting! What a wonderful way to meet a new author! Can't wait to read this!! I have several of your books that I have really enjoyed reading. Thanks for a chance to win your newest. Love this series,( have read all from the beginning) and I'm hoping Brian and Catherine get a new little sibling! All the characters are wonderful. I love this series. I want to know how Sarah is going to communicate with her new son. Maybe a murder at the school for the deaf? Maybe she and her new mother-in-law will work together on a mystery at the school? How about it VT? We already had a murder at the other school for the deaf. How many of these folks do you want me to kill off? That's an idea though. I'll put it on my list! Love the series and can't wait to read more! I'm always looking for new authors to add to my collection of books. This sounds like it's just what I'm looking for. I can't wait to get my hands in this book! Love the historical setting these stories provide! I absolutely love the Gaslight series...as my Klindle account can attest to. I just began Murder on Bank Street. Your books transport me to late 1880's New York. I would love to see a tv series or mini series with these characters that you have brought to life. I would love to see a TV series, too. From your lips to God's ears! What an interesting group of characters. The historical setting is nice too. Love the gaslight series very much and looking forward to reading the new one. I have read every book in this series and this new book sounds wonderful! I love when supporting characters are featured in their own books like this; you get to see a new side of them. Going to save this one for my upcoming vacation. Love the collaborative effort! Definitely sounds like all treat no trick! I have enjoyed every Gaslight Mystery I've read and look forward to reading this one as well. I would love to try something new!! What a fun tease! Can't wait to read the next installment. author and series a try! Thanks for the opportunity! I have been a fan since the beginning and it has been wonderful to see the evolution of the characters and the relationships. The depiction of New York City at that time adds authenticity to a great series. This series sounds very interesting---I'd love to read this book. I love this series and would love to win a copy of this book. I can't wait for your new book to come out. Thanks for the chance to win. Well, now I'm going to be wondering until the book comes out!! -_- Good luck everyone! Delighted to see so many fans of the Gaslight Mysteries -- I love 'em! Vicki and her husband are moving -- and guess what day the moving truck decided to show up?! She hopes to pop in later to visit with you, but I know you'll all understand if she can't make it. Me, I can hardly wait for this book -- Maeve takes a turn! Thanks for giving me this opportunity, Leslie! We have arrived at our new home and the moving van broke down, so we're not sure when our furniture will arrive. Life is always an adventure. This looks like a fantastic read! Thanks for the opportunity! Each and every installment of the Gaslight series is eagerly anticipated in my house Can't wait for the latest! I so enjoy Christmas mysteries! Can't wait to read it. I love, love, love this series! Thanks so much for the giveaway! I love the Gaslight series and can't wait to read the new one. This series allows me to escape my problems for a while and read about a different time in a suspenseful story that keeps me turning the the pages to see what happens next. Sounds like a great fun read! Sounds wonderful! I would love to give a copy a lovely home! Thanks for the chance! sounds like a fun angle, using someone other than the main characters. Gives you a chance to know them a bit better. Sounds good! :) Add it to my wish list. Looks like a very good book. Can hardly wait to read Murder On St. Nicholas Avenue. Thanks for the giveaway. Sounds exciting as always! Truly enjoy this series!! I have been reading this series for years! Love it! I would love to try one of your books! I would love to discover a new series to read. I hope that I win. Can't wait to read. Would like to add to my library. This bonus book is the best early Christmas Present I could hope for. I'm so excited!!! Thanks for all the kind words, everyone! I'm sorry I am so late to the party, but as Leslie mentioned, I'm in the process of moving, and I spent the day driving from my old home to my new one! I hope you enjoy the new book. It really was a labor of love. Glad you're safely in your new home! Now don't you wish you had Maeve to unpack for you? No furniture yet, but yes, when it gets here I'd like a whole army of Maeves to unpack! I'm completely enchanted by the Gaslight Mysteries! I'm almost finished with "Murder on Waverly Place", having worked my way here from the very first of the series, and this update from Maeve gives a delicious taste of what's in store with the later installments. Looking forward to each new adventure - good luck with your move, and in your new home! thanks for the chance. Sounds like an awesome read. I am so excited! This is going to be an awesome book!!! Your books are on my TBR list. This one sound very interesting! Definitely looking forward to the new book! My wife and I have both enjoyed them all so far, so I'm sure we'll be wired to this one. Thanks! OMG--so excited--I'm kind of sweet on Gino --so really glad he is back! CANNOT imagine Mrs Malloy helping out or Mr Decker for that matter. Mrs Decker on the other hand is just like me--if my daughter was out solving murders, I'd want to be right in the middle of the action, too! I'm all caught up on the Gaslights so am ready to trip the light fantastic on St Nicholas Avenue or at least catch a rat. I'm kind of sweet on Gino, too. I think you'll really like him in this one! I am a fan of Sally Goldenbaum's Seaside Knitters Series. I have connected to you through her. I am excited to have found this treasure trove of new authors to explore. Thank you for the chance to win one of your books...I have been a fan since I picked up the first one. :) I was excited to see you using a nurse as your main character...since I am an RN I love your choice. Can't wait to read your books. I am new to the cozy mystery world and I am very glad that I have found this world. Thank You for a chance to read one of your books. Would like to read this book. Thank you for the chance to win. Happy Halloween! I would love an opportunity to win and read one of your books. Your book sounds really good. Love love to read your books. Wow, I love to hear about new books and series, this is a new author to me. Can't wait to read this, sounds very good. Who doesn't love a Christmas mystery? I can't wait to read it. I hope I win! Murder on St. Nicholas Avenue sounds like a great book. Thank you for introducing me to Victoria Thompson and for this chance. Victoria Thompson is a new author to me. I would love to read her book. Thanks for the chance. I love Victoria Thompson books. I look forward to this one. What an awesome giveaway! This book sounds fabulous! Sounds like a wonderful Christmas read. Thanks. Love this series. Sounds like another great book by Victoria, thanks! Thanks for the bonus book. Great Christmas present to your readers! Whether I win it or not, I'm definitely buying it. Nice to see Maeve and Gino get their chance to shine! Nothing like a good mystery to read at Christmas time! This will definitely fill the mark. Thank you for another great read in this series. Sounds like a great mystery to read during the holidays! I love the beautiful cover as well. Sounds like a great mystery to read during the holidays. Love the beautiful cover as well! I am still catching up on a few of Victoria's older novels but I'd love to add this to my TBR pile. Love, love, love your books. Eagerly waiting for the next book! I got hooked when I saw the Greenwich Village title (worked there). Started with the first book - can't start a series in the middle & worked my way through. Got my BFF hooked also. For those who love to start a series at the beginning and know they'll have plenty of books to look forward to, the Gaslight Mysteries are a real treasure! So many new books and so little time! The cover is beautiful---and I'm sure the writing is excellent since your other books are. Thanks for the contest. This has been so much fun! I hope those of you who weren't familiar with the series will give it a chance even if you don't win. The first 16 books in the series are in paperback and eBook. I mention this because I know you'll want to read the whole series! :-) Here's hoping MURDER ON ST. NICHOLAS AVENUE gets us all into the Christmas spirit. This sounds like a great mystery. Thanks for a chance to win. I love Christmas books, especially cozies! Victoria Thompson! I love your books! Everyday as I walk about NYC, I think of how life would have been like for Sarah here. There is an antique ambulance in Bellevue that she could have been in! Please come to NYC for a book signing someday. I can't wait to read this book! I have quite a few of your books and am trying to collect the hardcovers. They have better size print than the paperbacks. I've read a few of the books and there were a few others that I started but didn't finish. I love Christmas mysteries. Congratulations to Michelle Willms, winner of MURDER ON ST. NICHOLAS AVENUE. Happily, St. Nick arrives tomorrow, November 3! Thanks to all of you for being part of the Killer Characters crew.